It's almost that time of year! Graduation is right around the corner, and whether it's a high school or college graduation, the students are ready to celebrate! 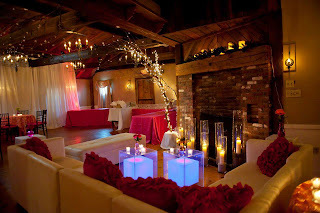 If you want to throw a graduation party that is going to be different from everyone else's, think outside the box! This blog is going to feature a college graduation party that Dana threw for his daughter last May. We're going to give you great tips on how to turn any space into a spectacular event! 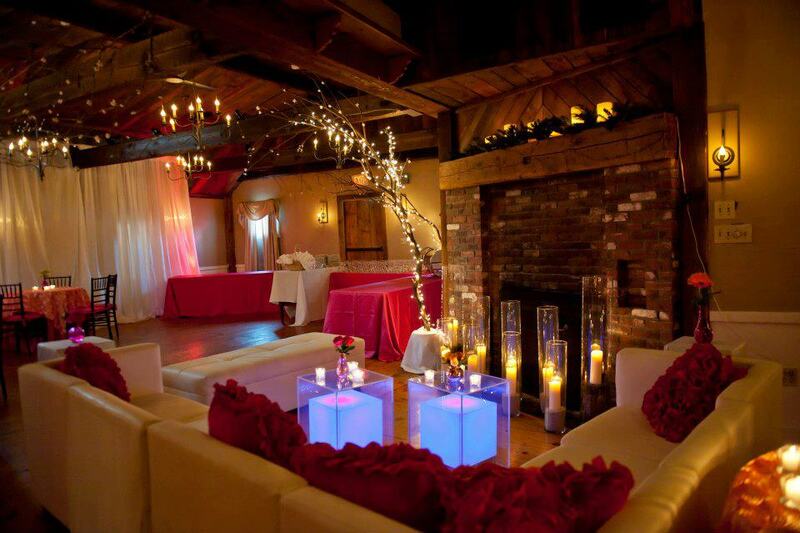 The graduation party took place at the 1640 Hart House in Ipswich, MA. If any of you have been there, you know how amazing the food is, and how beautiful and rustic the space is! Dana really wanted the room to transform into a contemporary design, while still having some of the rustic features that the room is known for. In front of the fire place he used lots of candlelight, and even used trees draped in lighting as an extra touch. 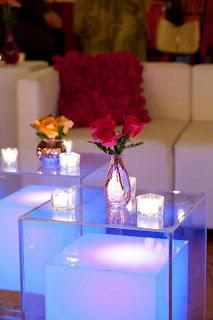 Also, he brought in two white leather couches with bright, funky pillows and two glow tables to really bring a pop of color into the room! The lounge-type feel the couches bring, help guests feel like they can relax while having fun at the same time! It's comfortable and relaxing for you and your guests! Here's a better look at the pillows used on the leather couches. Rather than just using regular pillows, Dana went for bright, vibrant colors that also added extra texture to the room. 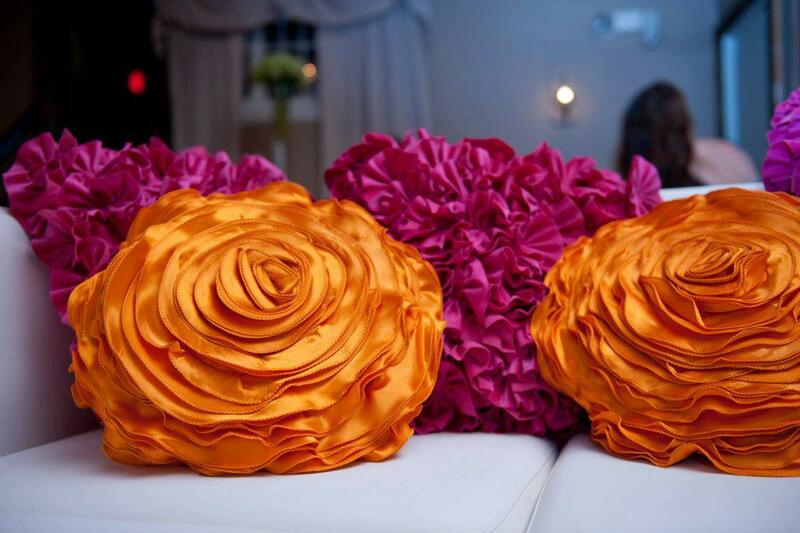 You may not think that using ruffled or textured pillows would make a difference, but trust me, every detail counts! Also - they were super comfy!! 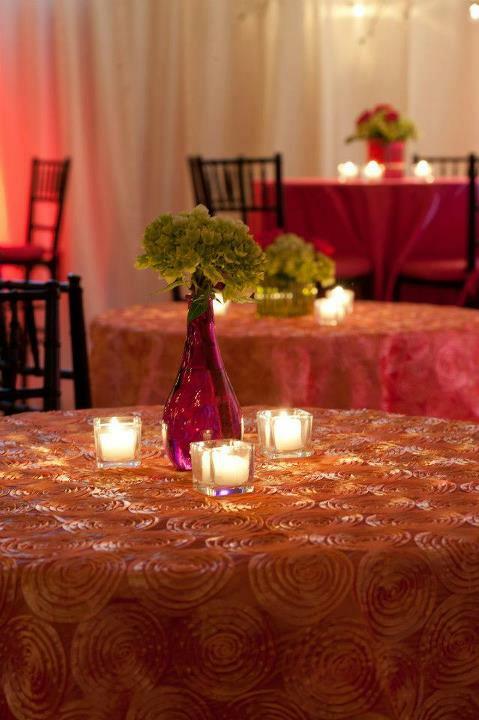 Okay, starting with the top photo - how much do you LOVE those table cloths? Just like the pillows, they have an extra touch of design to them which makes the color stand out even more. It also contrasts great with the simple green centerpieces on the table! In the second photo, you can see that Dana piped and draped the whole room. 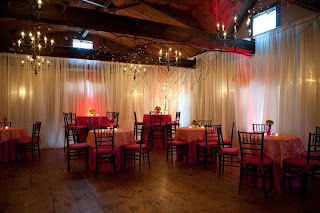 He used sheer off-white draping to add to the contemporary design, but also, it made the night feel much more private and special! 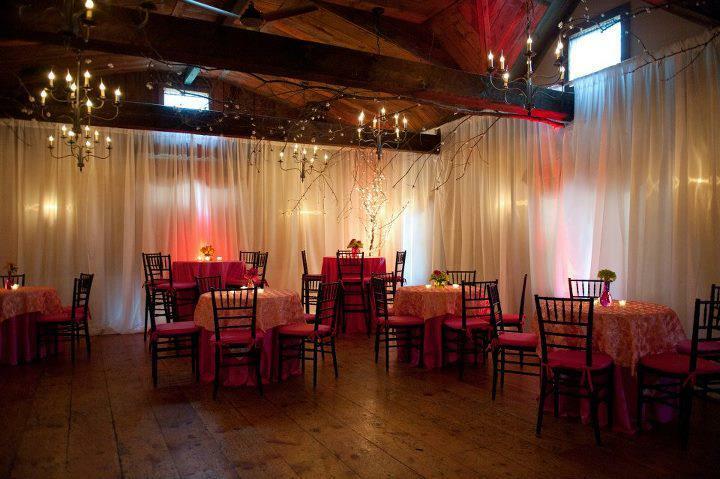 Using lighting behind the pipe and drape is also a great idea because it gives off a beautiful glow. Here's a shout out to Jenny Cakes for surprising the family with a Peanut Butter and Jelly cake for the special evening! Let me tell you - it was amazing. Having a fun flavor like that at a graduation party is so different! It will have all of your guests wanting more - and it looks fabulous too! This is an idea you will LOVE. 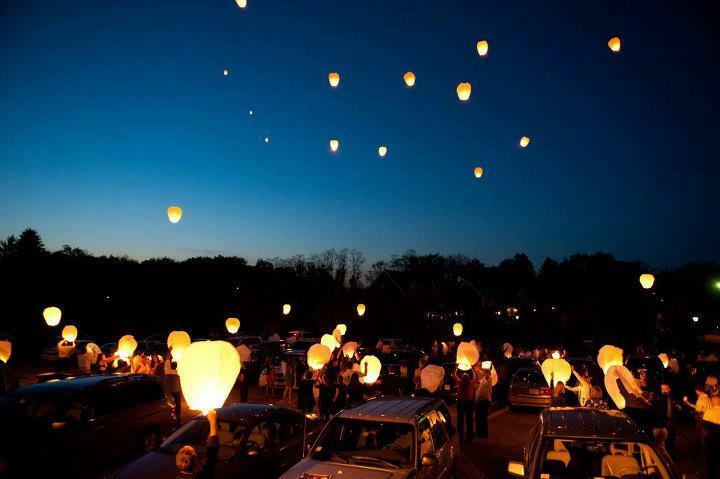 Two months prior to this graduation party, Dana's beloved wife Liz passed away from brain cancer. 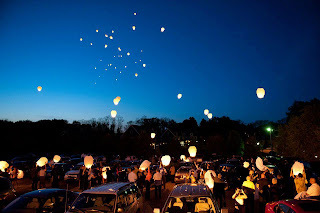 He and all of the guests surprised his daughter Amanda with lanterns that floated up into the sky as a tribute to Liz. 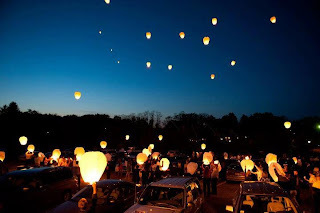 If you have someone special that can't be at your graduation party, this is an amazing way to pay tribute to them and feel like they are there with you! And if you don't have someone special that can't be there, but love the idea, do it anyway! It's such a beautiful sight and it's a way to bring all of your guests together! Since graduation is right around the corner, take some of these beautiful ideas to make whatever space you're going to use, be spectacular! 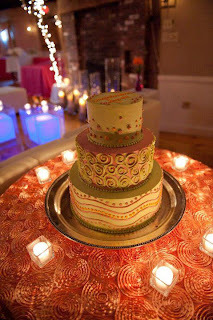 No matter how small or big you want your party to be, the decor should always be something unique and representative of the person you're throwing it for! Think about what they love and it will be a night to remember!